Celebrating the life of Toivo E Rist, M.D. Be the first to share your favorite memory, photo or story of Toivo. This memorial page is dedicated for family, friends and future generations to celebrate the life of their loved one. Obituary for Toivo E Rist, M.D. 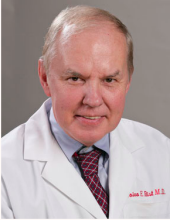 Toivo E. Rist, M.D., 72, passed away on January 1, 2019 from Parkinson's Disease. He was a Dermatologist for 30 years in Knoxville. He attended the Medical College of Georgia and spent 10 years in the Air Force where he was a line officer and medical corps officer. He came to Knoxville in 1977 to start his Dermatology practice. He enjoyed talking to his patients and loved helping them. His passion was his job and he considered his staff part of his family. A lifetime Lutheran, he attended Faith Lutheran Church and loved his pastor, Dr. Bob Stelter. He is survived by his loving wife, Connie Francis Rist; son and daughter in law, Jeremy and Patty Rist; daughter, Karli Rist; step-daughter and son in law, Jill and Matt Cogburn; special daughter and son in law, Carrie and Brandon Murphy; grandchildren, Rylan, Gregory, Lilly, James, Avery, and Emily. His celebration of life will be held Saturday, January 5, 2019, at Faith Lutheran Church in Farragut. Receiving of friends will be at 10am followed by a celebration service at 11am. Memorial donations may be made to Faith Lutheran Church, 225 Jamestowne Boulevard. To send flowers or a remembrance gift to the family of Toivo E Rist, M.D., please visit our Tribute Store. "Email Address" would like to share the life celebration of Toivo E Rist, M.D.. Click on the "link" to go to share a favorite memory or leave a condolence message for the family.